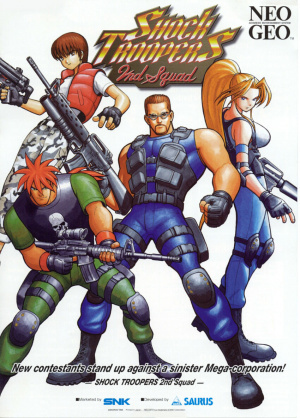 Much like the original Shock Troopers game, 2nd Squad is very much inspired by the early days of arcade gaming, when overhead run-and-gun titles like Capcom's Commando were in vogue. 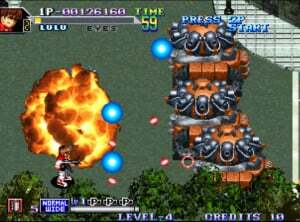 While the game has a very Metal Slug feel to it, the multi-directional scrolling and 360 degree movement and firing make for quite an intense and engaging experience. The team mode has been dropped, but the developers have tossed in a few unique gameplay twists to not only make up for the loss, but also add even more speed and intensity to the game. 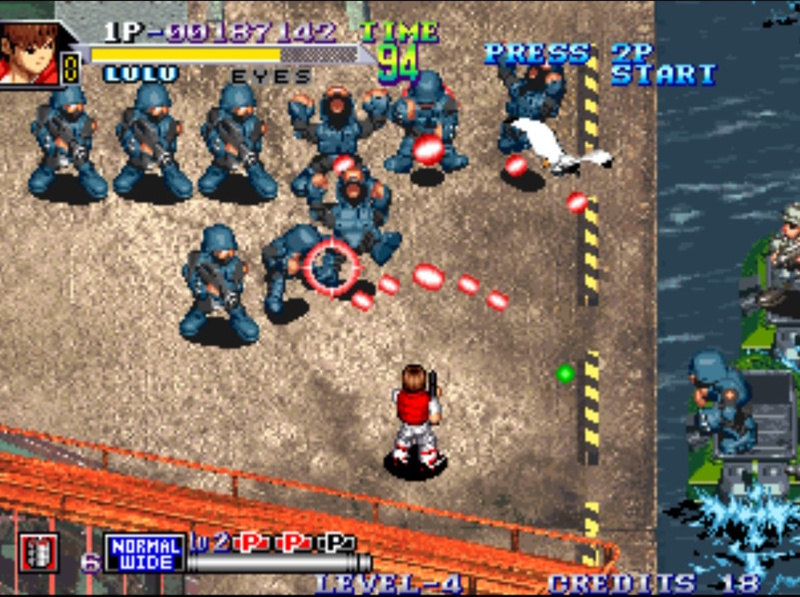 The gameplay has seen a bit of an overhaul for this sequel, removing the team battle mode from the first release and replacing it with a four-player selection. You have your choice of four characters, each having their own unique speed, attack, and defense. As before, you can fire your primary weapon or - if you get in close - execute a rather cool melee attack. You also have bombs at your disposal and the ability to jump if things get a bit too hectic. A fun addition comes in the ability to jump into a vehicle and then pilot it around the level, Metal Slug-style. With this comes a huge boost in firepower, not to mention a rather devastating charge attack. You'll want to spend as much time in the various vehicles as possible, especially when you get ready to tackle the game's tougher bosses. The levels are fairly intricate in design and there is a wealth of multi-directional scrolling throughout them - at one point even placing you on top of a moving train. Since you're going up against a never-ending barrage of enemies and their firepower, the game does toss you a bone in the form of power ups. Some will increase the power and range of your weapon while others will earn you more bombs. This element not only assists you in your progression through the game's war-torn locations but also balances out some of the more challenging sections you'll be faced with. Like the gameplay, the visuals get a rather hefty upgrade as well. 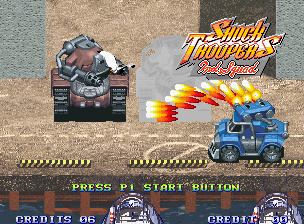 Shock Troopers 2nd Squad still possesses a very vibrant and cartoon-like aesthetic, but the added touches like faux-3D visuals and transparency effects do add a nice added layer of realism. The characters have been rendered in 3D and then turned into flat, 2D sprites - the same technique used in Donkey Kong Country. Some will prefer the hand-drawn visuals of the first game to this new look, but even so, you can't accuse the game of being unattractive. The level of variety is also quite good as no two environments look alike, and when you toss in the rather impressive train sequence, you've got plenty of visual flair to enjoy. With the speed and graphical intensity there is a bit of slowdown from time to time, but it's nothing Metal Slug fans won't be used to and it's certainly not a big hindrance to the game itself. The musical score of Shock Troopers was really good and 2nd Squad is no different. Chip tunes abound and there are quite a few tracks to enjoy. But once again, the sometimes annoying voiced dialog and constant moans of dying enemies does overshadow it at times. That's something of a trademark of many Neo Geo titles, sadly. 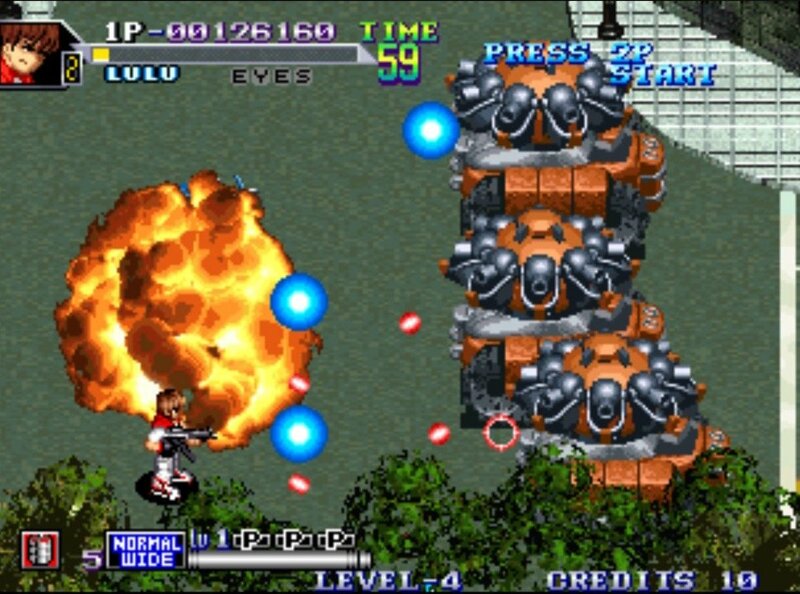 It seems most Neo Geo fans are split on which Shock Troopers titles is the better game, but it's difficult to ignore the increased speed and more aggressive style that 2nd Squad brings to the table. The ability to pilot vehicles and brandish the increased firepower they offer up gives the game some added punch, and the level designs are top notch as well. If you're a run-and-gun fan, it's certainly worth checking out either title, but when push comes to shove, 2nd Squad just feels that little bit meatier. I prefer the first one. Better graphics, music, more characters, paths, setting. I really really dislike the graphics and music in the second. There's no need for the health bar since you mostly die in 2-3 hits. Also some of the weapons are silly. Just doesn't feel as polished. The logo looks worset too imo. Now why have I never heard of this game before? This looks like my kind of game! I like both games and it really is hard to decide which one is better. Just get them both. I'll get this one, since the first one is on a compilation disc. The fact that I keep staring at Angel is a little disconcerting. Sweet...I'll have to get this. I enjoyed the 1st game. This would be awesome on my Wii U Gamepad. C'mon Nintendo, chop chop! I also prefer the first one, but with that said, this is still an awesome game and a worthy purchase. The first one is better, but this is worth it, too. I wonder if Angel suffers from back pain. If she were a real person, there's no way those things could be natural. 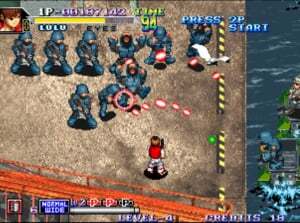 Oh man, I still have the Shock Troopers 1 on PS2 SNK arcade game. I'm gonna need this game. You really did your readers a disservice with this review. If you play this game two players it slows down to an absolute crawl. Did you play 2-players before doing your review? Well heads up readers. The game goes into slow motion.